Looking to keep warm this winter? 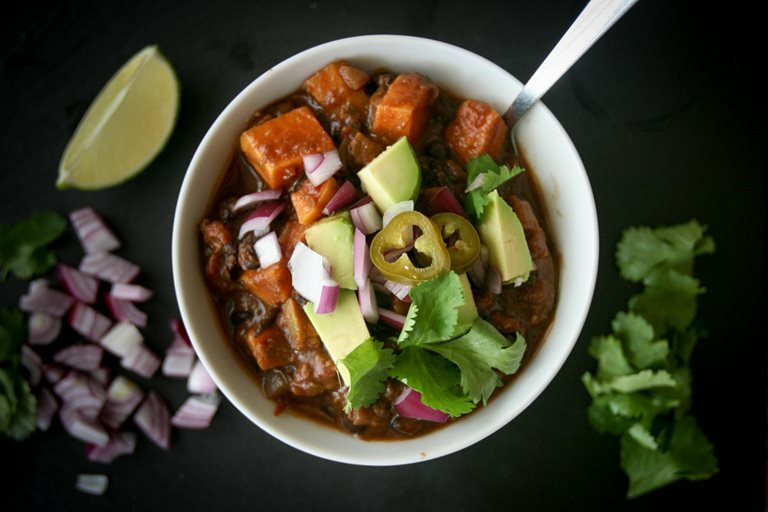 Try this tried and tested fantastic veggie chilli, combining sweet potatoes, jalapeños and black beans. This recipe is a total blast from the past. My friend Abby made it for her boyfriend (now husband) and I on a cold snowy winter’s evening in Milwaukee several years ago. We’d spent the day cross country skiing in the bitter cold. It was amazing, but very hard work (it was my first time skiing ever! ), and coming home to a big pot of piping hot chilli (and a few bottles of VERY cold beers) was hugely rewarding. I haven’t changed the recipe much from the original - Abby herself said she likes to “play around with the spices”, so I did that, too, adding a bit of cinnamon and Mexican oregano for a bit of interest (Abby likes to add Herbs de Provence). 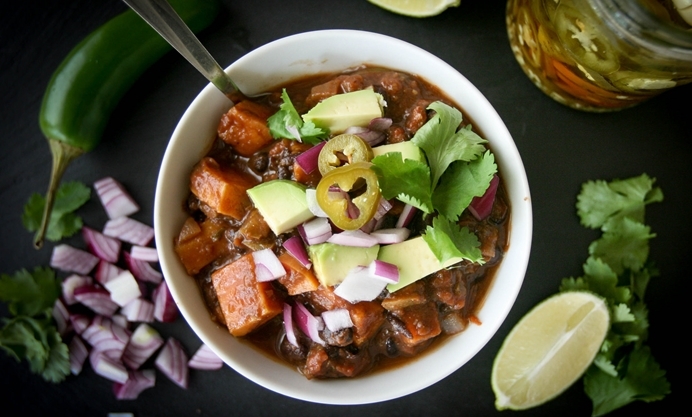 Such is the awesomeness of veggie chilli. It’s hugely adaptable and it’s hard to go wrong. But one thing you do need is good ingredients, and on this particular occasion I felt very grateful for having beautiful organic sweet potatoes to work with. Their flavour really came through against the cocoa and cinnamon, making for some serious comfort food that feels very much needed as the weather turns truly autumnal. I like to serve this chilli with loads of garnishes: fresh cilantro, lime, raw onion, my homemade pickled jalapeños and lots of avocado. You could also add cheese or sour cream if you’d like, or a sprinkle of toasted pumpkin seeds for a bit of crunch. And to really make it special, serve with a big wedge of cornbread and a bottle of good beer on the side.